Want your wedding to sparkle and shine? 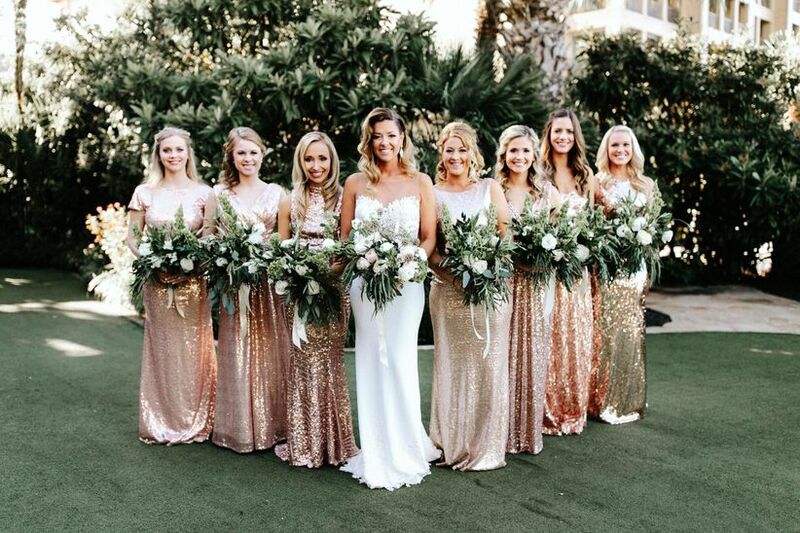 Check out these metallic wedding ideas to add a glamorous twist to your big day. If you’re all about the glitz and the glam on your big day, then we’ve got the trend for you: metallics. 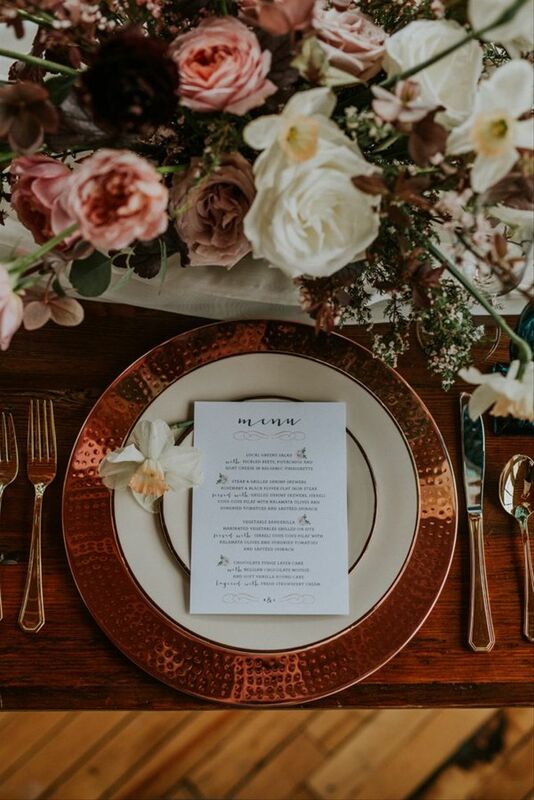 Gold, silver, copper, rose gold — there are so many metallic wedding ideas to choose from. 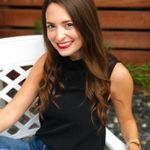 This striking, showstopping look is the perfect way to bring a bit of shimmer and shine to your reception or ceremony (or even your personal bridal style). 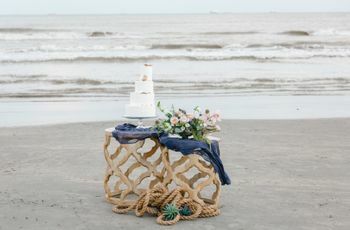 Whether you want your wedding to dazzle like a disco ball or have the subtle glean of a starry night, there are countless ways to include this glimmering touch to maximum or minimum effect. These metallic wedding ideas show the perfect take on this glamorous trend. 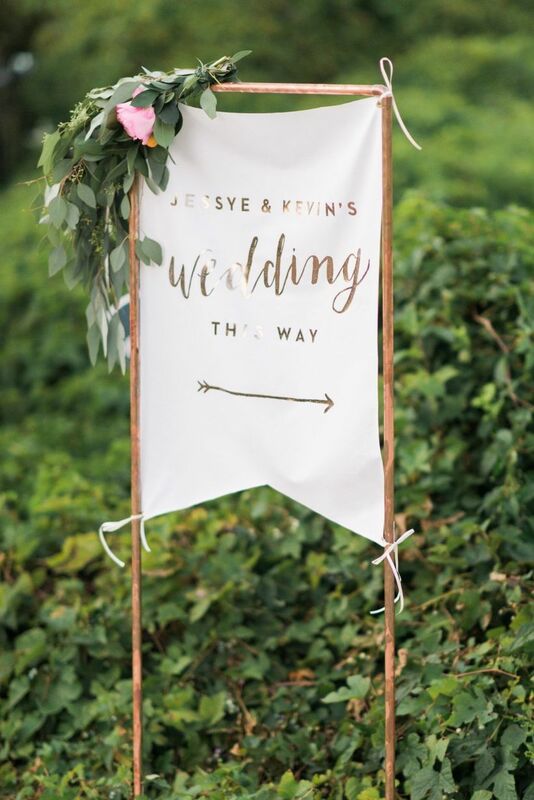 Tarnished copper pipes are the ideal frame for a linen wedding sign boasting gilded gold calligraphy — the two metallics come together for a look of understated beauty. 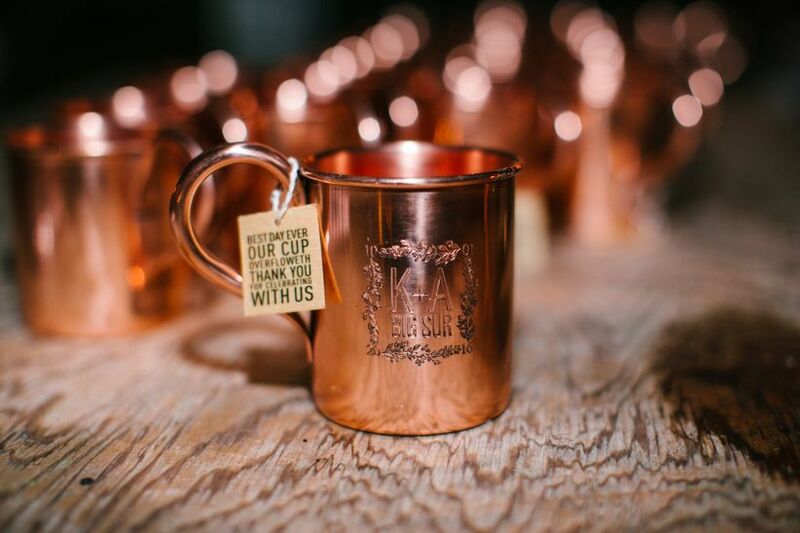 Shiny copper mugs are the perfect favor to send off your guests with — they can use them for a hot cup of tea or cocoa back at the hotel or for a nice cup of coffee the following morning. We especially love the idea for a cozy winter wedding. Gold ceremony chairs with simple, white cushions are every bit classic elegance. You can’t go wrong with sophisticated metallic wedding ideas. 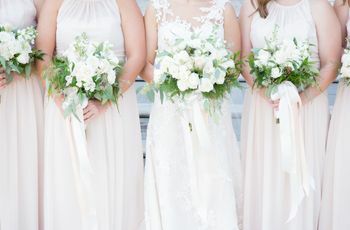 Don’t forget about your bridesmaids! Dress them in mismatched metallic bridesmaid dresses so they glitter down the aisle and on the dance floor. 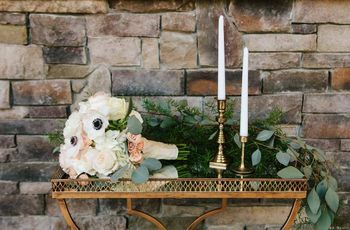 These champagne, gold, and blush hues make for a magical palette that’s both fun and showstopping. Metallic plateware and flatware can really make your place settings shine, especially in a decadent penny-colored hue. Framing the rim of the plate, the warm, gleaming color brings the tablescape to life while complementing the husky tones of the floral centerpiece for an autumnal look. 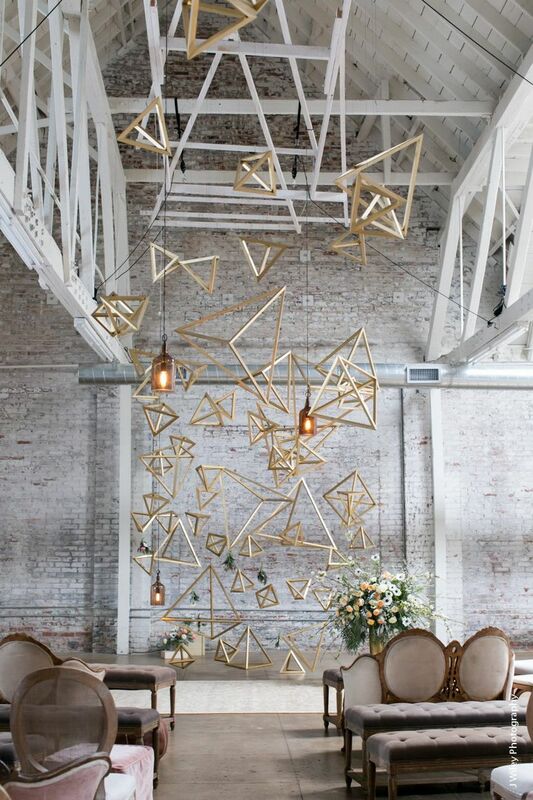 An installation of geometric gold pendants cascading across the ceiling and as a ceremony backdrop brings unique, modern metallic wedding ideas to an industrial ceremony venue. Silver table numbers have a subtle metallic glean for a fresh look that provides just enough glam without being overbearing. 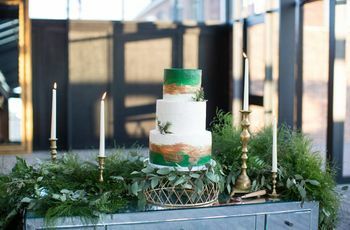 Whether it’s silver foil accents or gilded fondant, metallic touches are one of the hottest wedding cake trends right now. 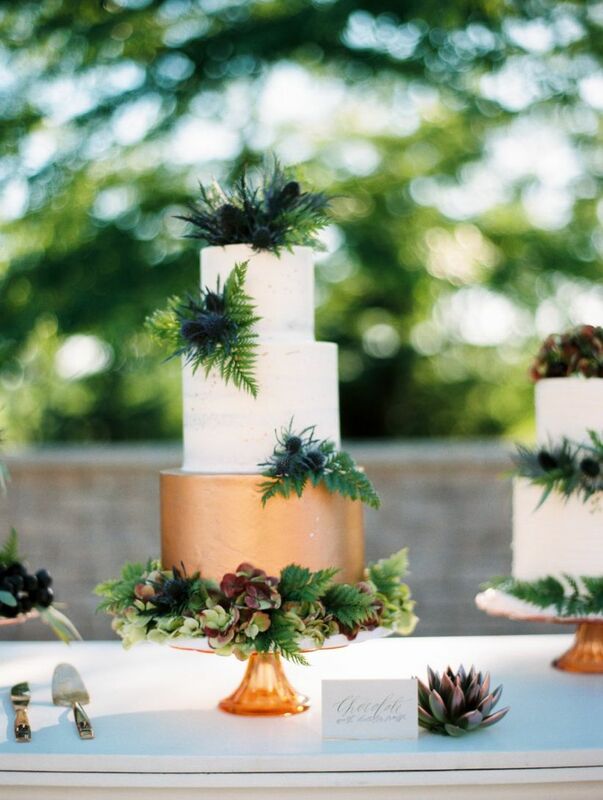 This three-tiered metallic wedding cake takes it on with a smooth copper finish accented by another major trend — succulents and greenery. 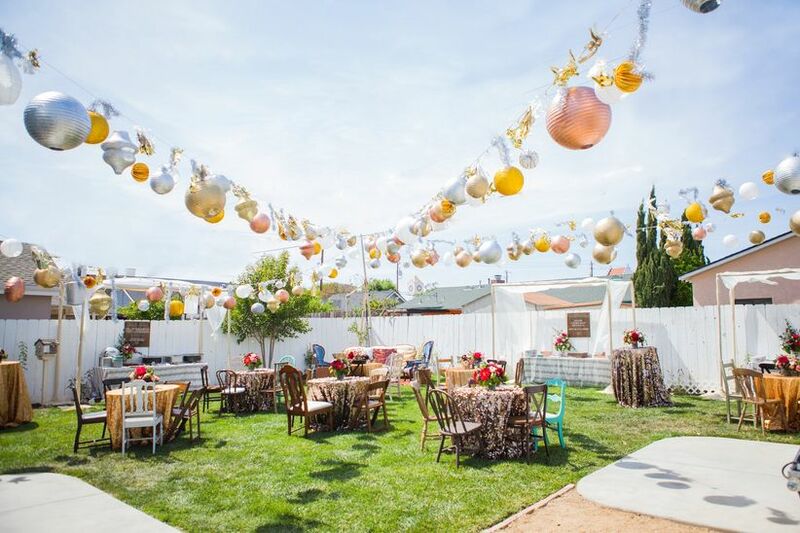 Chinese lanterns in metallic finishes of rose gold, silver, and gold bring a playful and whimsical feel to a backyard wedding. 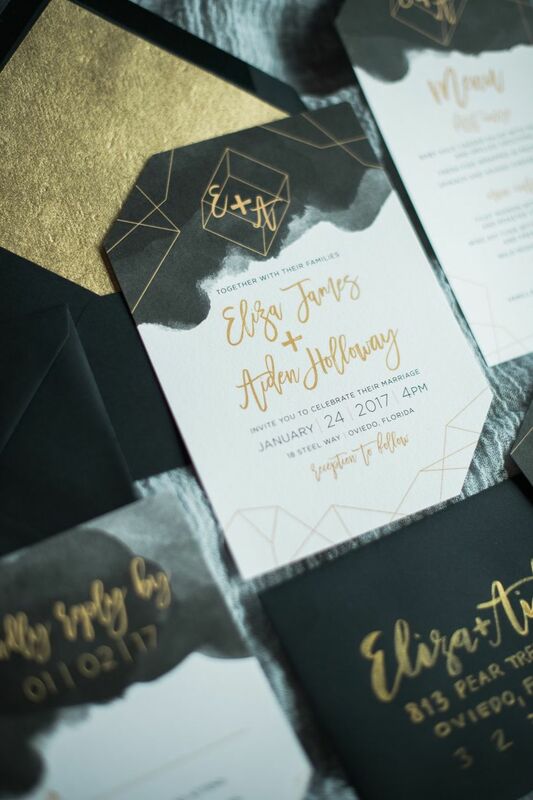 Incorporating metallic wedding ideas into your invitations will set the tone for your glam wedding — we love gilded accents in the form of calligraphy and design on the invites and gold metallic foil inside the envelope to open up with a wow factor. 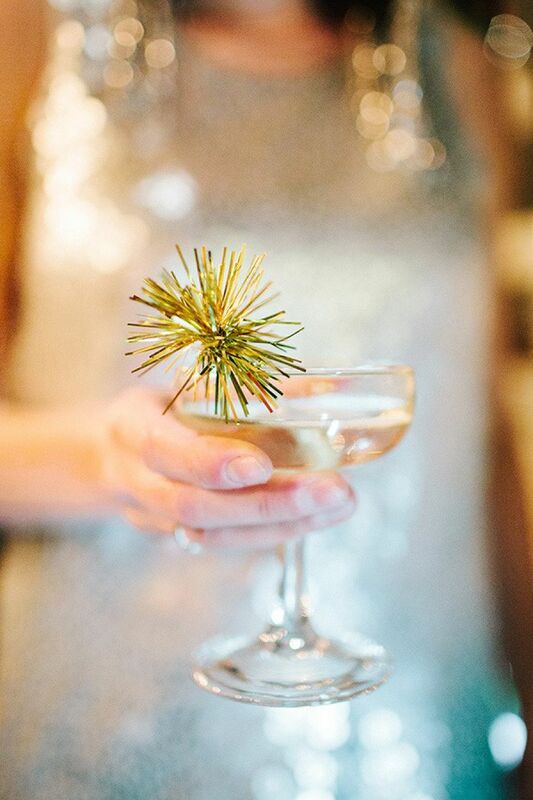 Glitzy pom-pom accents are a fun, playful way to liven up your cocktails. They’re especially perfect for a New Year’s Eve wedding! 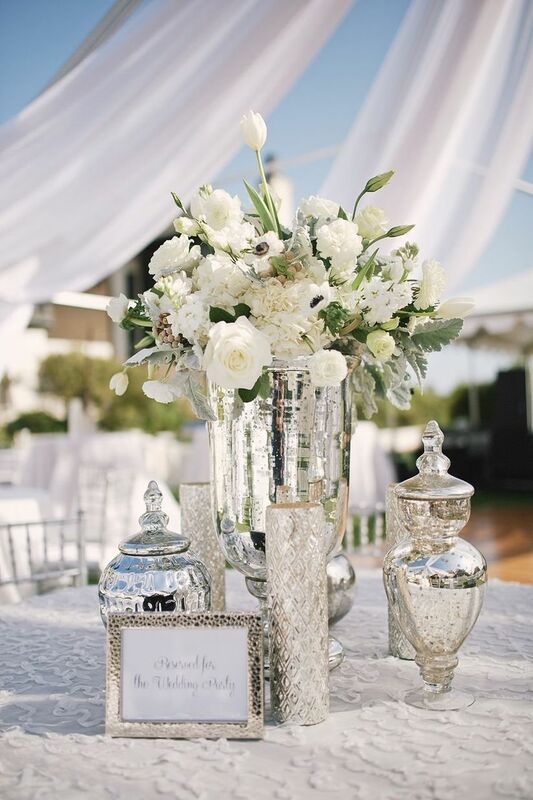 Silver mercury glass vases come together for a striking centerpiece that’s all elegance and sophistication. 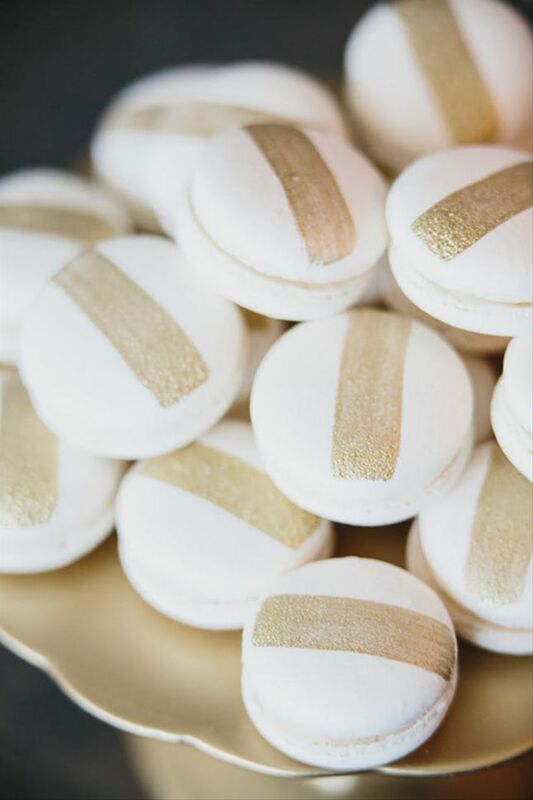 As if macarons aren’t already chic enough of a dessert, they get even chicer with metallic gold strips of frosting. Touches like these are a great, simple to way to personalize your desserts to tie in with your wedding theme; place them on a gilded platter to perfect the look. 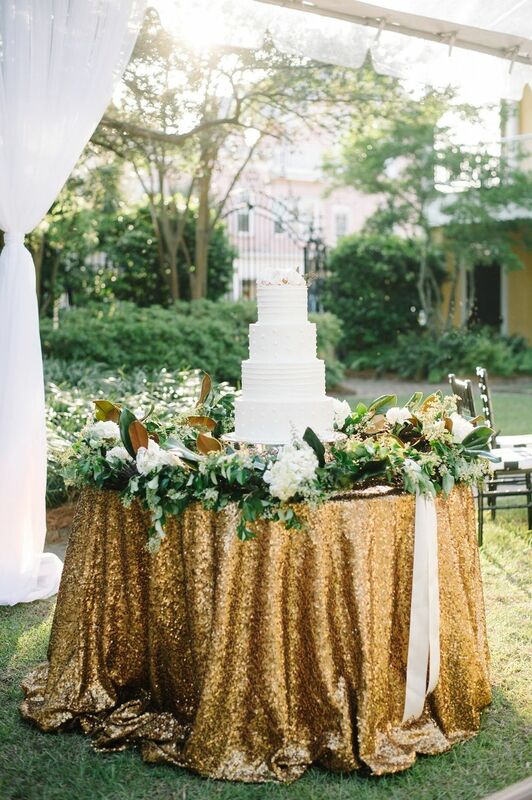 How dazzling is this gold sequin tablecloth? It’s metallic to the extreme, and we heart every bit of it. Don your dessert table — or reception table — in sequin tablecloths to make a glitzy statement. If you really want to bring on the glamour, mix and match with shades of gold, silver, rose gold, and copper. 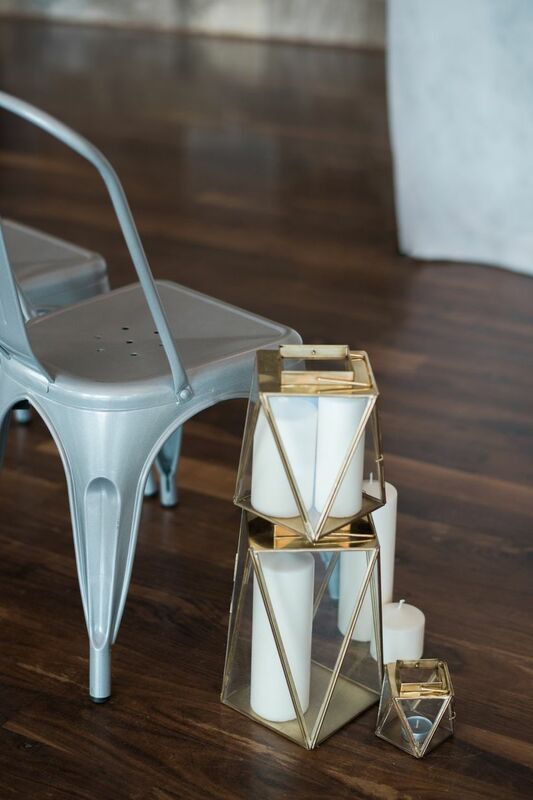 Geometric lanterns edged in gold bring metallic wedding ideas and a modern feel as aisle markers, complementing silver metallic industrial chairs.